PLC Sorting Control System Example. Custom Engineered PLC System. PLC Control Sorting System. PLC Program for sorting products. Products are arranged by the operator, in order to interrupt a sequence of photo switches. The sequence determines the next process that each product must go to. The system logic is designed to manage misaligned products and properly send them on to the next process. This is a complex task since the order in which the switches are picked is variable. Of prime consideration: maintain the pattern, and routine practice of operators. No retraining of the procedure was required. 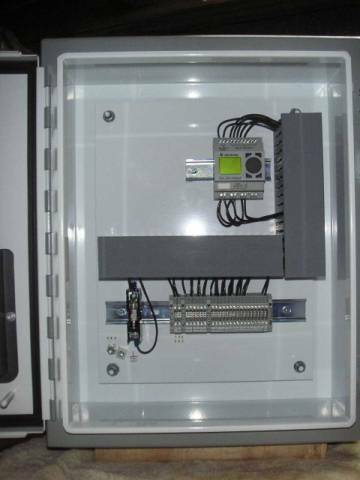 Additional space is provided on the backpanel, and DIN rails, for customer expansion devices such as relays and switch inputs. Customer wire numbering, terminations and functions are maintained. The program, circuit diagram, PLC software and operating manual are all delivered in a durable, binder with protective coverings for all documents.